One of the stubborn holdovers from my days of reading almost solely historical fiction (if I ventured into the young adult section at all) is a fascination with World War I stories. Mix WWI with sci-fi or fantasy, and I cannot help myself. No, really. For example: Scott Westerfeld's Leviathan series, or Suzanne Weyn's Water Song. If you can think of more titles in this vein, BY ALL MEANS tell me in the comments!!! I will devour them. Oh, and yes, this forthcoming middle grade novel fits the bill (fairy tales + World War I), so I'm (of course!) very excited. 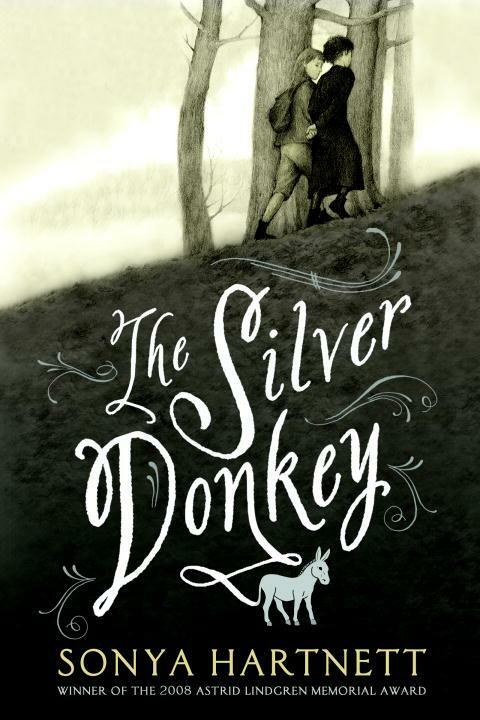 Sonya Hartnett's The Silver Donkey was released in Australia in 2004, but it's just making its way to the USA. It will be released by Candlewick on February 11, 2014. One morning in the woods of World War I France, two young sisters stumble upon an astonishing find - a soldier, temporarily blinded by war, who has walked away from battle longing to see his gravely ill younger brother. Soon the care of the soldier becomes the girls' preoccupation, but it's not just the secret they share that emboldens them to steal food and other comforting items for the man. They are fascinated by what he holds in his hand - a tiny silver donkey. As the girls and their brother devise a plan for the soldier's safe passage home, he repays them by telling four wondrous tales about the humble donkey - from the legend of Bethlehem to a myth of India, from a story of rescue in war to a tale of family close to the soldier's heart. Sonya Hartnett explores rich new territory in this inspiring tale of kindness, loyalty, and courage. O interesting. Different. I like it. Great pick. I'm sure I know some, but can't think of any . . . I think you've read both In the Shadow of Blackbirds and The Sweetest Dark series, which are the only two coming to my mind. Never heard of this before but sounds really interesting. Great pick.